The amazing personal audio company came into town with a few items that really caught our attention, namely the ATH-ANC9 and the ATH-WS55. 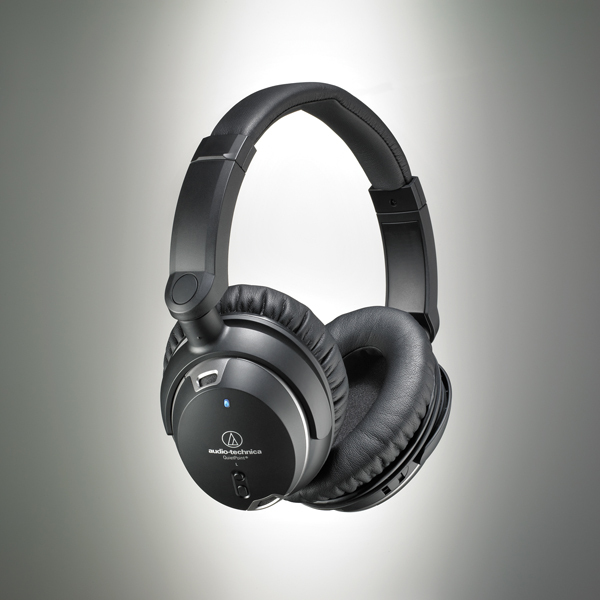 The former is the new flagship, noise-canceling headset designed to be able to negate varying amounts of ambient sound. The latter is a part of the Solid Bass series of headsets, which consists of 2 over-ear models and 3 earbuds. 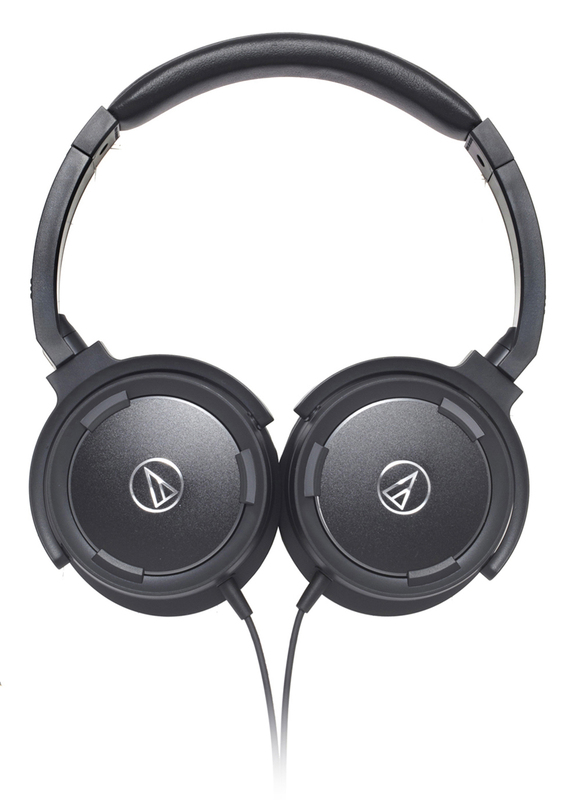 While the noise-canceling did sound good on the ATH-ANC9, it didn’t impress us as much as the Solid Bass model. The ATH-WS55 sounded like a champ, even in the extremely noisy environment of a trade show floor. And the pop of color helped them to stand out from the rest of the lineup. We will definitely be taking these for a spin around the neighborhood for a more in-depth review. Oh, and just for kicks, here’s a video Audio-Technica produced for the Solid Bass series. It’s a fun video that showcases the spirit of the Solid Bass line. Warning: if you’re not a fan of dubstep, don’t press play. NYNE really caught our eye with a road bicycle and a baby stroller sitting in front of their booth. It should go without saying that those are two things that, on their own, don’t belong at an electronics trade show. What we found upon further inspection was a myriad of products that really let your music shine without you having to put something on. 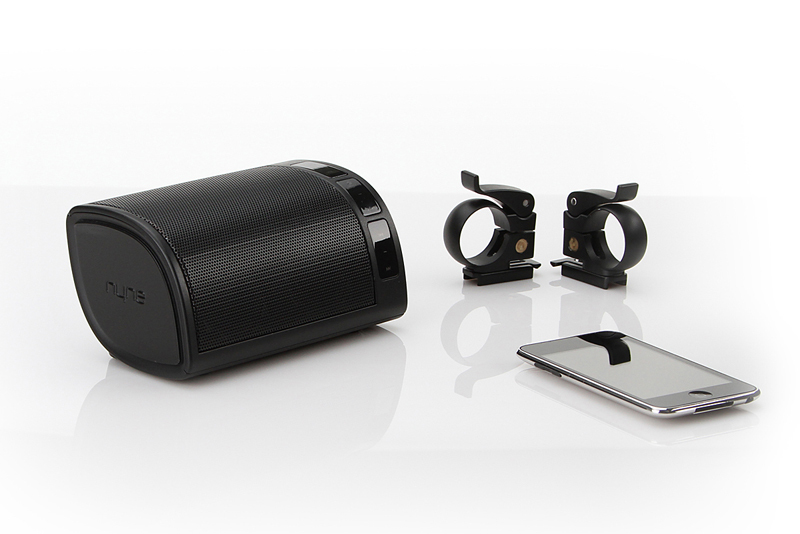 The product being showcased on the bicycle and stroller was the NB-200, a portable-Bluetooth speaker/microphone that comes with a clamp system to attach to pratically anything with a handle bar. This product does have a microphone that works over the Bluetooth, so once paired to a smartphone, calls can be made and answered without reaching for said phone. The other attention grabbing product from NYNE was the much larger NH-6500. 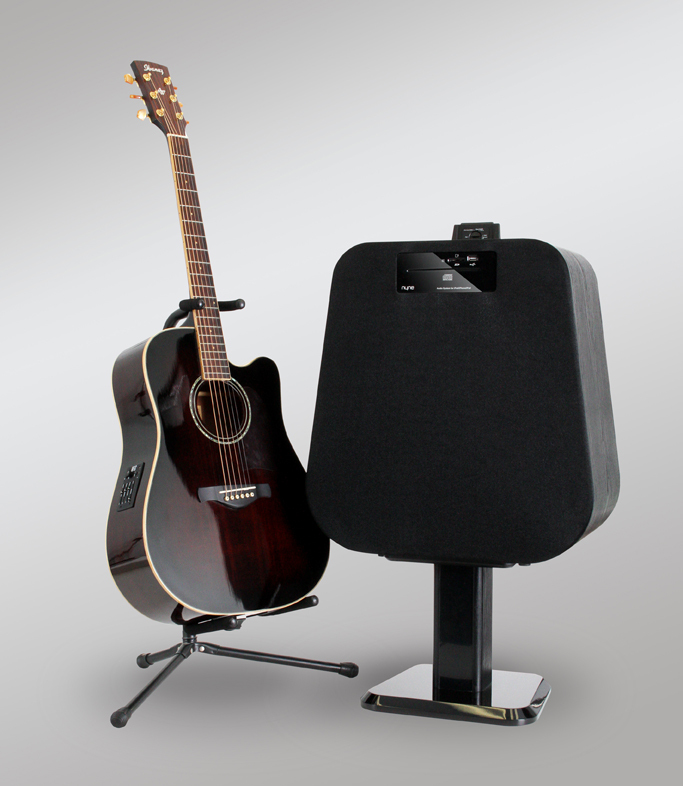 It might look like the bottom half of a guitar was turned into a speaker on a stand, but does it sound good. The NB-6500 comes witha host of features that made us want to take it home with us. Imagine having Bluetooth connectivity, iOS device dock for playback and charging, CD player, USB.SD card slot, and wired AUX input all in a single device that has 2 full range drivers and a massive subwoofer. Oh and did we mention that it also functions as a guitar amp? Yeah, we’ll take 2.
iHome is a home and personal audio company, for those of you that might not of heard of them before. They also had more products than we could shake a stick at. Seriously, with a table crushing 16 products, it was a lot to take in. Walking up to the table though, we saw two products that we immediately fell in love with, the iP4 and the iP76. The iP4 was a return to nostalgia with a modern twist. 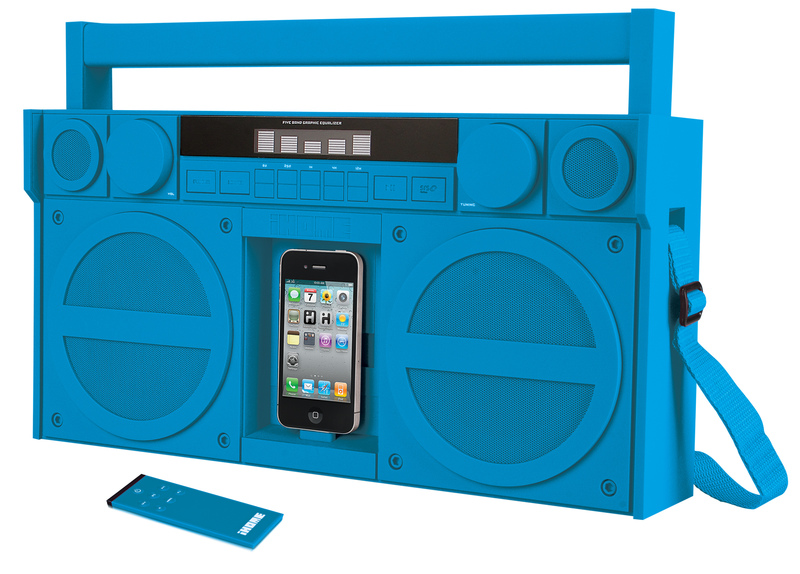 What could have easily been mistaken as a model, was a fully functional boombox. Not only that, but it also has an iOS dock that charges and plays tunes. The entire thing is covered in soft-touch rubber and even has a remote that sticks to the back via magnets. Our only concern was, like the old “ghetto blasters” of yore, the iP4 runs off 6 “D” batteries. The iP76 was more of a flash forward to a a bright, neon filled future rather than a throw back to a generation past. This 3ft tall mono-tower speaker sports Bluetooth connectivity along with an iPod/iPhone dock, and color changing side panels. There’s also AUX cable in for devices without Bluetooth and even component video out to connect to a TV. We were told that the iP76 wouldn’t be able to be used in pairs as a set of stereo speakers, but we think we could figure out a way. It may seem that most people just want to get a new TV, put it on just about any surface that will support it, and start watching. However, there are a growing number of consumers that want their new purchase to look just as good off as it does when they’re using it. OmniMount has some of the most amazing mounts we’ve ever seen. Trust us, it takes a lot of care to make a monitor mount exciting and OmniMount does it with the Play and Work series. The Play series is comprised of 5 models: the Play20, Play20X, Play40, Play40DS, and the Play70. All of the numbers in the model names represent how much weight they can bear and each uses patented Constant Force (CF) technology. The CF technology gives all of the mounts a range of movement that generally aren’t available if consumer level products. To be specific, it was the Play20 and Play20X that really caught our eye. 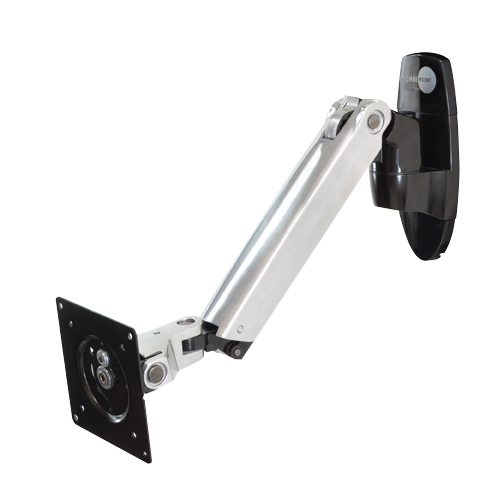 They 2 mounts can tilt at the bracket that attached to the monitor to be nearly parallel to the ground. While traditional monitors might not be very beneficial from this, imagine having a touchscreen mounted on the wall that you could pull down and interact with. Yeah, that would be awesome wouldn’t it? Just FYI, the difference in the two is that the Play20X has an extra 9 inch arm that adds another pivot point for the mount. The Work series builds on the growing trend of standing desks and makes one of- if not the best- hybrids we’ve seen. 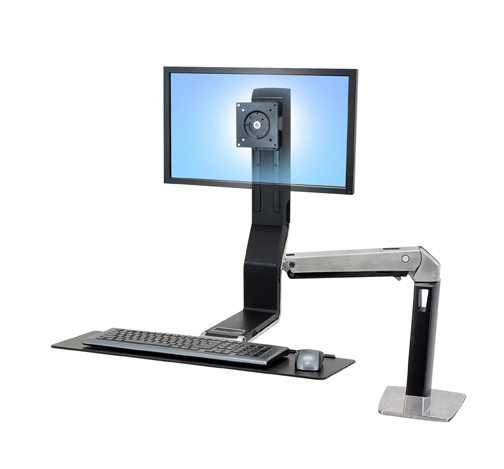 The Work15 and Work20 are standing desk mounts that can be adjusted with the just one hand. Both feature a monitor mount and keyboard tray. The big difference here is the Work20 supports a dual monitor setup, while the Work15 only handles a single monitor. Being able to go from sitting to standing without having to make any change to your work space is a great time saver and we think a great way to improve your health while (supposedly) working. Rounding out our interesting gadgets from CE Week, Westinghouse had 2 new toys that we took notice to. We’re sure that you’eve heard of Westinghouse before as they’re in just about every big-box store. A lot of TV for a little bit of money is what Westinghouse is all about. 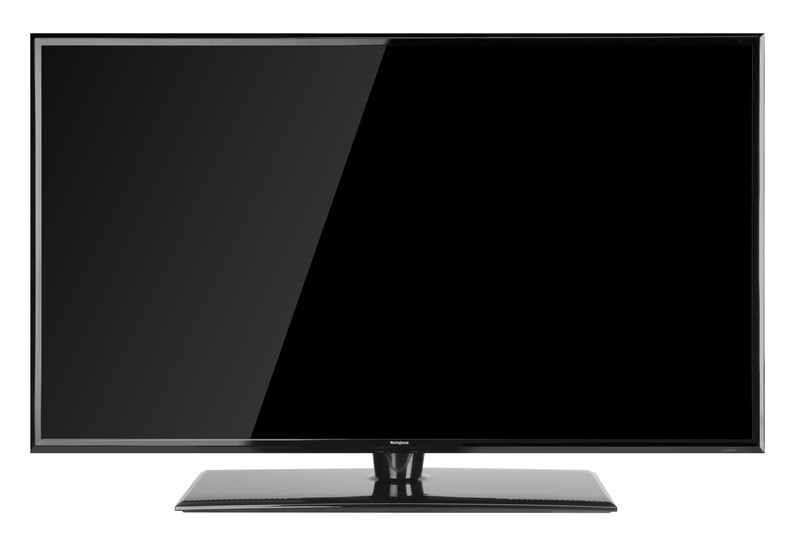 The obvious product anyone would be drawn to from a TV manufacturer is a TV. The wow started with the new additions to the Digial Slim Series, the EW39T4LZ and EW46T4LZ. These TV’s are 39 and 46 inch respectively and have some amazing picture quality. Both feature 1080p resolution with 3 HDMI ports, 1 composite, 1 component, and one VGA port. Most importantly, with respect to the series name, these units are incredibly thin. Both models sported depths that would make super models jealous. Officially, the depth is 1.38 inches on both units. 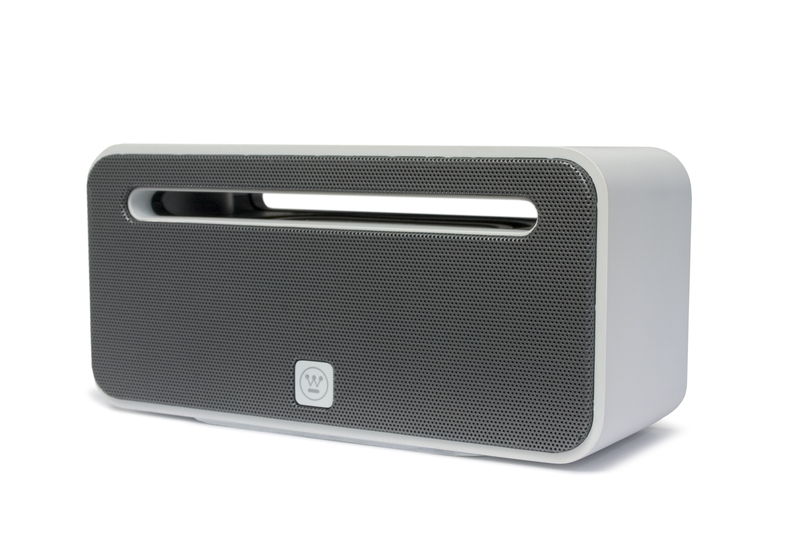 The other product Westinghouse was previewing was one that we didn’t see coming from a TV manufacturer: a portable, Bluetooth speaker. On display right next to the beatuiful displays, were these tiny speakers called the Unplug Sound System. Covered in soft-touch rubber, these tiny wireless speakers were pumping out a good amount of full and rich sound. Not only did they look and sound good, but they listened well too. The USS comes with a built-in noise cancelling microphone for taking important calls anywhere, which could come in handy for making conference calls. CE Week was a blast and we definitely saw our fill of new gadgets. Be sure to check back soon as we’re going to reviewing some of the items mentioned above.